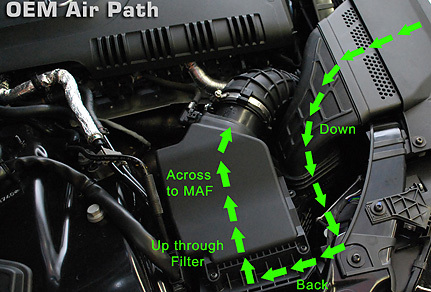 This intake is an incredibly popular aftermarket upgrade, and for good reason. If performance is what you are after, expect both increases in horsepower and torque. Additionally, you get improved throttle response and fuel economy. What’s not to love? APR's latest carbon fiber intake for the 2.0/1.8 TFSI engine is a ram air design that completely separates the intake filter from the engine bay. Building from years of experience on and off the race track, APR's engineering teams have spent countless hours developing a true cold air and ram air carbon fiber design that can be recreated affordably for the street performance enthusiast. APR has gone even further to maintain all OEM specifications necessary to integrate cohesively with an otherwise stock engine to avoid raising eyebrows at the dealership. Flexibility was another characteristic of APR's design whereas the new TFSI intake is also suitable for Stage 1 and Stage 2 modified engines all the way up to and beyond APR's K04 Turbocharger System. Constructed of aerospace grade carbon fiber and designed to remove intake restriction, APR’s intake system provides smoother transitional airflow, increased air velocity, superior insulation of the incoming air to reduce intake air temperatures and a larger volume of available air to aid throttle response and turbocharger spool. The OEM intake system vents some of the incoming air into the engine bay and takes several twists and turns before the air ever reaches the turbocharger. 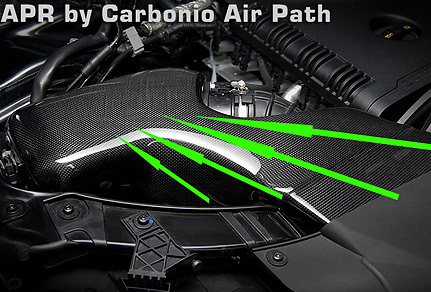 The Carbon fiber intake system simplifies the intake system by directing all incoming air directly at the filter. Install guide can be downloaded here.